All Standard A-10's ordered after April 5, 2011 will only be available with case colored finsh. The A-10 American™ shotgun epitomizes what a truly fine shotgun should be. In designing the A-10 American™, the only thing more important than the aesthetic beauty was the superb feel and functionality. The A-10 American™ engraving features very tasteful scroll and bouquet engraving. The A-10 American™ is a very low profile, shallow frame full sidelock over and under (not a box lock gun with side plates) for those who demand the very best. This is the highest form of the gunmaker’s art. Some benefits of a hand detatchable sidelock gun are perfect trigger pulls, intercepting safety sears, an easily removable action for cleaning and service, and a large surface area for the outstanding engraving. All A-10 American's feature black American walnut which is unmatched in beauty and is much denser and stronger than most other gunstock wood. Click here to learn more about American black walnut. The A-10 American™ is incredibly unique because it is crafted with many of Connecticut Shotgun Mfg. Co.'s proprietary techniques. One of these techniques is our trademarked Hard Gold™ system which we use on internal components that are subject to wear. The gold prevents corrosion and the parts have a special hardening processes that will add many years to the life of the A-10 American™. The barrels undergo our trademarked Cryo Pattern™ process which deep freezes the barrel to remove stress. The bores are then coated with our trademarked Tuff Bore™ process, allowing you to shoot steel shot or any other shot that we know of. These are some of the reasons we offer a limited five year warranty on the A-10 American™. The A-10 American™ is made and sold directly by Connecticut Shotgun Mfg. Co. This avoids any unnecessary costs and allows us to give our customers the personal attention that is required with such a highly specialized product. If you are a shooter, sportsman or a collector, please consider the A-10 American™. 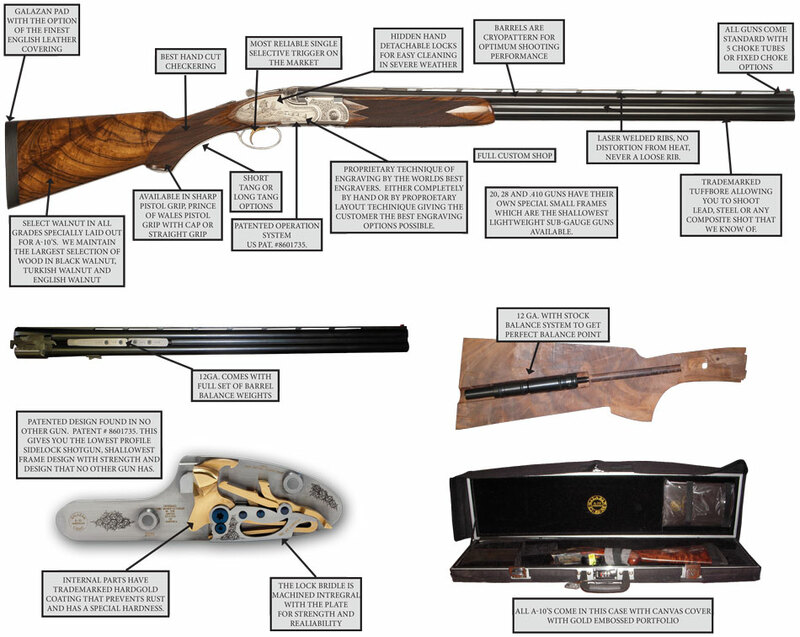 There is nothing like owning a full sidelock over and under shotgun, it is the very highest form of the gunmaker’s art and it is built by Connecticut Shotgun Mfg. Co. to the very highest world standard. If you are considering buying the A-10 American™ as a gift, let us help with our A-10 American™ Gift Certificate. Call to order at 860-225-6581.